Our September production this year is based on the much-loved TV comedy, “The Vicar of Dibley”. All your favourite characters from the hugely popular series – Alice, Hugo, Owen, Jim, David and of course Geraldine – will be on stage to bring you an evening of fun and laughter. The ancient old vicar of Dibley has passed on and parishioners are horrified to learn that the Bishop has appointed a woman in his place. As Geraldine battles to win over the sceptical parish council, the villagers (with the exception of influential David Horton) gradually learn to accept her as The Vicar of Dibley. This show brings together some of the best loved moments from the TV series and links them to make a wonderful evening of comedy, culminating in a fairy-tale wedding. Performances are in Bishopstoke Memorial Hall from Thursday 27th to Saturday 29th September 2018 at 7.30pm. Tickets are £8 (£6 for those aged 16 or under) and are available here or email boxoffice@bishopstokeplayers.uk or phone 07871 006551. 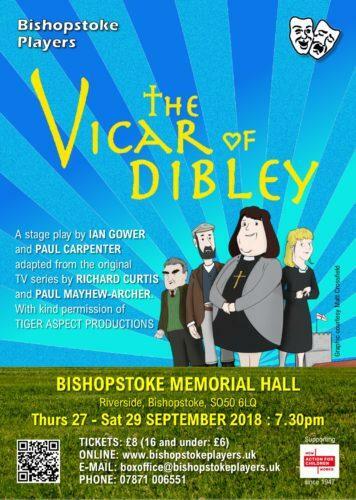 “The Vicar of Dibley” has been adapted for the stage by Ian Gower and Paul Carpenter from the original TV series by Richard Curtis and Paul Mayhew-Archer. With kind permission of Tiger Aspect Productions.